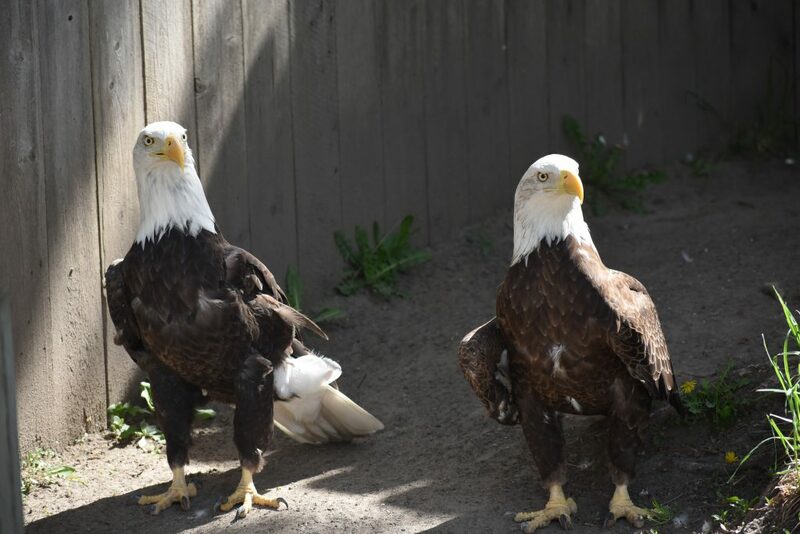 The Zoo is home to two bald eagles — Aerie and Marahoute. Each received permanent wing injuries while out in the wild. Unable to fly, they would not be able to hunt for food or evade predators, and surely would not survive. They are owned by the government, and the zoo has special permits to house them here. We provide them a sanctuary and, in return, they dazzle us with their beauty! 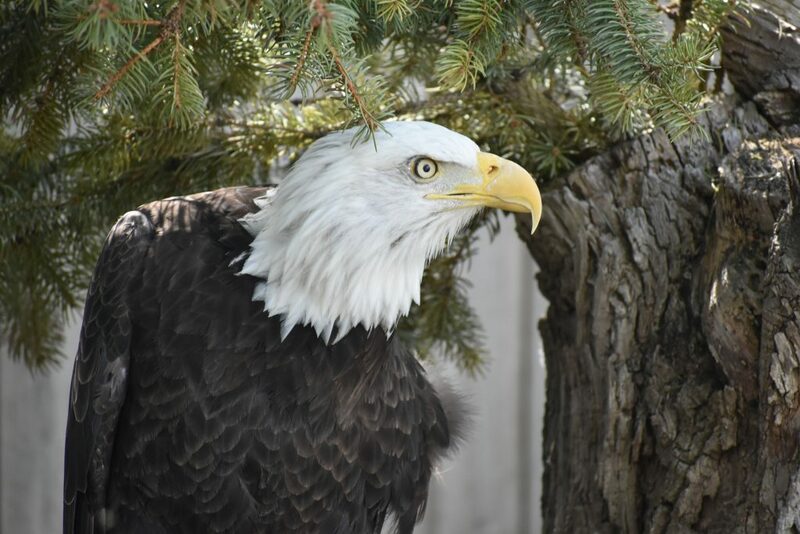 In 1782, the bald eagle was chosen to be our national emblem because of its long life, great strength, and majestic looks. The head of this bird appears to be featherless from a distance, hence its name. Eagle wings have deeply slotted tips for soaring and long distance flight. These magnificent birds of prey live close to the water, often flying at speeds of up to 40 miles per hour and diving at speeds of over 100 miles per hour. Their keen sense of vision allows them to spot their prey while soaring high in the air. Bald eagles are carnivorous birds that hunt and kill other animals. They have talons for seizing prey and a hooked beak for tearing it apart. Raptors have keen eyesight and can pick out prey from miles away. Bald eagles can swim, too. They use their wings in a “butterfly strokes” fashion. They can live up to 50 years in captivity. In 2007, the bald eagle was taken off the Federal List of Endangered and Threatened Wildlife and Plants. They are still protected by the Migratory Bird Treaty Act and the Bald and Golden Eagle Protection Act which prohibits the take, transport, sale, barter, trade, import and export, and possession of eagles, making it illegal for anyone to collect eagles and eagle parts, nests, or eggs without a permit. The only exception to this is Native Americans who are able to possess these items since they are traditional in their culture.